Garden City, New York: Doubleday & Company, Inc, 1963 Hard Cover. 8vo-over 7¾"-9¾" Tall. Very Good/Fair dust jacket; no owner's names, map decorated endpapers, Profusely illustrated, Appendixes, Indexed, 650pp. Price Unclipped.. Very Good/Fair. Doubleday & Co., 1963. Very Good. No Jacket Ex-Library. 8vo-over 7¾"-9¾" tall. Cover shows light edgewear; spine slants slightly; interior pages clean, slightly darkened; inside and back cover show a library stamp.. Hard Cover. Good/No Jacket. Garden City, NY: Doubleday & Co. (1963), 650pp, illus., slight waterstain to pg edges (doesn't affect interior), slight shelfwear.. Hard Cover. Good/No Jacket. Ginn and Company Navy board are scuffed, rubbed and chipped. Fep and title page missing. Student names on feb. Text pages are clean with no markings. . Hard Cover. Fair/No Jacket. 8vo - over 7¾" - 9¾" tall. Garden City NY: Doubleday & Company. Very Good with no dust jacket. 1963. First Trade Edition. Hardcover. Small 4to 9" - 11" tall; 650 pages . Garden City (NY): Doubleday, (c1963). Blue cloth.. VG+/VG- dj. 8vo. Numerous black & white photos + color endpaper maps.. Book Club Edition. Garden City: Doubleday & Company, Inc, 1965 Hardcover. Acceptable/No Dj. Oversized. Garden City, NY: Doubleday & Company, 1963. Hardcover. Near Fine/Good. First trade edition. Thick octavo. 650pp. Blue cloth. Owner's name and address penned on half-title, near fine in a very good price-clipped dustwrapper, internal dampstain, short tears on spine ends and corners. Metropolitan Books, 2014. 1st Ed. Hardcover. New/New. Signed. 1ST PRINTING SIGNED BY SENATOR WARREN! As new, lovely gift-quality condition. Expedited shipping is welcome. Bk 3; signed by author. New York: Bantam Books, 1988 First Printing of the First Edition. Signed by Jimmy Carter directly on the front-free end page. Book and dust jacket in fine condition. Harper Collins, NY,1999, 194 pgs. 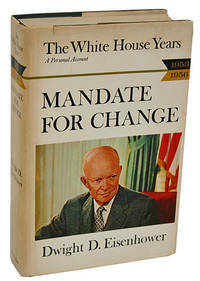 First Edition, First printing in Fine/Fine condition. Signed by the late great Joan Rivers on a pasted in bookplate issued by the Palm Beach County Jewish Federation. This is an as new, unread, tight,clean, unclipped copy. New York: Times Books, 1997. Signed on the front-free end-paper by President Carter with his full name: Jimmy Carter . First edition / First printing. Tan paper spine, light beige paper-covered boards. Very fine in very fine dust jacket. A beautiful copy.